I’ve just upgraded to windows 10 and found that XAMPP/WAMP Apache won’t start anymore for some reasons. It will simply attempt to start but then fail and ask the user to check the Apache error logs. The “culprit” or should I say, reason, is because windows 10 comes with a service known as World Wide Web Publishing Service (I will just call it WWWPS for short) which is started automatically when windows starts and uses port 80 by default. Port 80 is what Apache in XAMPP/WAMP uses by default as well, and hence why the error above since port 80 has already been taken by WWWPS. 1. Run Command Prompt and type services.msc, then click OK.
2. Scroll To World Wide Web Publishing Service. Note that the Status should say that it is Running. 3. Double Click on that row. Change the Startup type from Automatic to Manual. Next, click on Stop to stop the WWWPS service. Don’t worry, unless you’re running some software that depends on the Microsoft IIS Web Server, you should be fine. 4. Now, try to start Apache again. Yup, that’s all and it should work. Please leave a comment if this helps or you have other suggestions. I just did exactly what you say but it stills not working. Any other suggestion please??? excelent. I tried 1000 way. and read 100000 Article and didn’t work. thank you. your solution is the best. My Apache started after stopping IIS, but defined virtual host still not works, why? Brilliant, David. Worked a treat. Many thanks! I followed you instructions and it failed to work. Then I ran XAMPP control panel as administrator and it works. Just to add another thought. This seems to be the issue for me. I ran the XAMPP control panel as administrator and it works … (don’t seem to have the World Wide Publishing Service on my computer for whatever reason). I was looking for a solution to this problem and find this. Thanks to you, my problem is solved! Thanks so much for this tip. It worked like a charm!!! Thank you! This fix did it. Run Apache Run! hello.. i was fighting with same problem..
it is an unsatisfiying Error message above and i’ve tryed to run my httpd.exe from CommandLine. than i checked the root path in my config file and it was seem correct..
pls. check your rooth path twice, and naming of your folders (if you renaming the root on desing time). 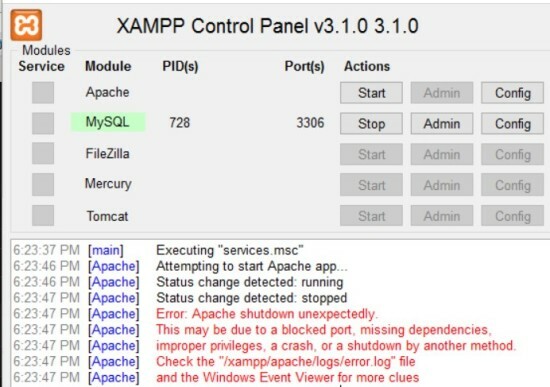 Xamp giving the same error in this case. Tried to install wampserver on my Windows 10. Get error httpd.exe cannot start correctly 0xc000007b. Tried all tips here and in other places, still nothing. wamp icon remains red, no services running, there isn’t any Apache log to examine. Yes, IIS is stopped, W3SVC too, changed ports from 80 to 8080, all VC++ dlls are installed, tried just runnin httpd.exe as admin but it won’t work. Thank you so much! It worked perfectly (Apache 2.2) !!! WWWPS service wasn’t installed in my w10, still the apache service can’t run. why? Great. It works, mate. Thank you so much. Hi tried your solution but i cant seem to find WWWPS, its a new computer. windows 10. [Sun Jan 10 11:13:05.858351 2016] [mpm_winnt:notice] [pid 8384:tid 500] AH00354: Child: Starting 150 worker threads. Thanks very much David. It works. Your great article solve my problem. Hi to all, i have the problems with Apache. Thanks it is running on local-host. I had that in mind but could not access the service. 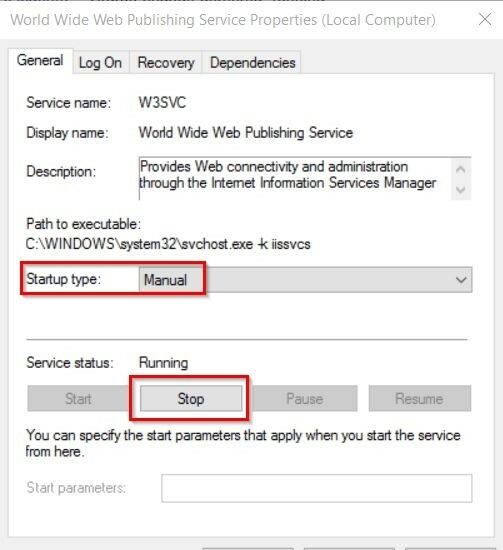 Found these instructions by accident and while they didn’t work for me, I wanted to pose the following question to whoever reads this: My XAMPP apache 2.4 will not start on computer reboot because the IP Helper service is already started. Once I shut down this sevice, apache runs fine. Has anyone come across this before? I don’t have IIS installed. Also worked great for me. I was about to reinstall Apache and waste a bunch of time. Thanks tremendously! same as min bro. I coudnt find wwwPublishing service. my xampp is still not working. I tried many ways but nothing happens. From now it is working….. This article was helpful bro. I tried looking for the service but it’s not listed, what do I do now? If changing ports isn’t working then try this: Install Visual C++ and reinstall Xamp.